After finding out his wife wants to leave him to pursue an exciting life as a furry, neighborhood nice guy Maynard Geiger gets drunk on Moonshine and goes tromping around town dressed as a gorilla. This leads to a string of Bigfoot sightings which puts their small, troubled city of Pottersville on the map. Nothing says Christmas quite like a bankrupt town, a furry fetish, and a Bigfoot hoax. 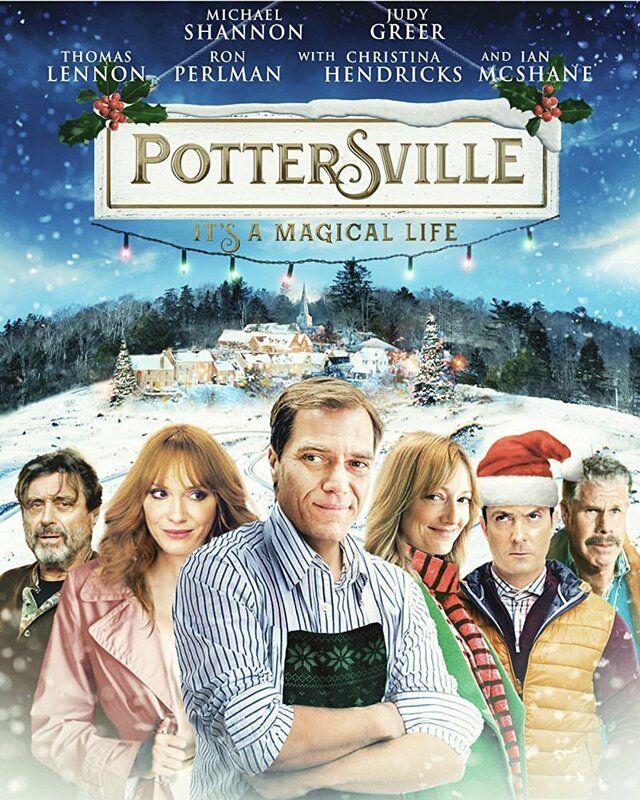 These are the themes of the straight-to-VOD film "Pottersville," written by Daniel Meyer and directed by Seth Henrikson. This is the feature film debut for both of them. For a movie with such an odd premise, one might assume it stars likes of Pauly Shore or even John Cusack, the VOD king as of late. Surprisingly, this film boasts a great cast including Michael Shannon, Ron Perlman, Judy Greer, Ian McShane, Christina Hendricks, and Tom Lennon. "Pottersville" revolves around a local general store owner and an all-around nice guy named Maynard Geiger, played by Shannon. His shop is one of the few businesses left operating in town since the local lumber mill shut down. One day, Maynard decides to leave work early to surprise his wife, only to find her dressed as a giant rabbit and frolicking in bed with a man dressed as a wolf. The shock of the situation leads him to get drunk and dress up in a makeshift gorilla costume while traipsing and stomping through town. This leads to a slew of Bigfoot sightings, which brings fame, tourists, and reality television to their small town. "Pottersville" has an absolutely absurd premise. The idea of a drunk guy in a gorilla costume getting mistaken for a Sasquatch, or "Squatch" as Tom Lennon's character Brock Masterson calls it, has some opportunities for humor already built into the plot. The question is, do the writer and director execute it well? There are some things about this movie that are so insane, they can and most likely will make the audience giggle. Overall though, most of the humor, unfortunately, brings only minor chuckles. This may be because Tom Lennon is meant to be the principal source of comedy, and for the most part, his shtick as a fake Australian outdoorsman just doesn't work and most his jokes are wildly bad. In some ways, there is a little bit of joy in thinking, "oh my god, I can't believe they made this movie and got all these people to do it." Was this because of contractual obligations? Was it a bunch of people doing favors for friends? Or was it, as Ron Perlman put it on his Twitter page, purely a labor of love? Michael Shannon playing the town nice guy is honestly a questionable choice, even though we love and appreciate him so much as an actor. He very well may be a nice guy in real life, but he has spent most his career playing villains and has a resting look on his face that says "if you aren't careful, I will slit your throat while you sleep and I might even hum a ditty while I do it." There's a reason he plays baddies: because he does it so well. Don't get us wrong, he's fine here, but we think he's just a bit miscast. Bigfoot being real we can believe, but Michael Shannon being the town sweetheart may be asking us to suspend our disbelief a little too much. This movie is quite literally all over the place. We never thought we'd have to review a Christmas movie where furries play a central part of the theme, but here we are, reviewing "Pottersville." We're not kink-shaming in the slightest, but the topic doesn't exactly scream "yuletide cheer," now does it? It's truly a wonder how this movie got made, but we certainly cannot say we hated it. It's got its problems and its goofiness, but if you can set all of that aside, you might enjoy this movie. You can locate the above-mentioned movies online watchfree.